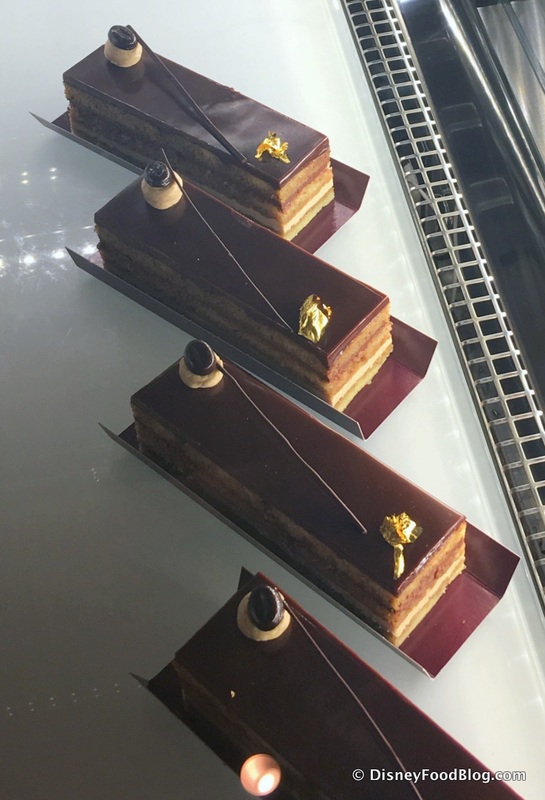 But the sisters are as interested in artistic expression via beautiful and delicious pastries as they are in other forms of art. And so you see evidence of their handiwork throughout the shop. We’ll get to some sweet examples in a minute, but first, let’s look around a bit. I was expecting more light from above, like an artist’s studio. Instead, ceilings are high, with warm wooden beams and whimsical painted touches outlining some of the wood. This Tiffany-inspired chandelier is framed by beams, and stands out over the front entrance of the store. 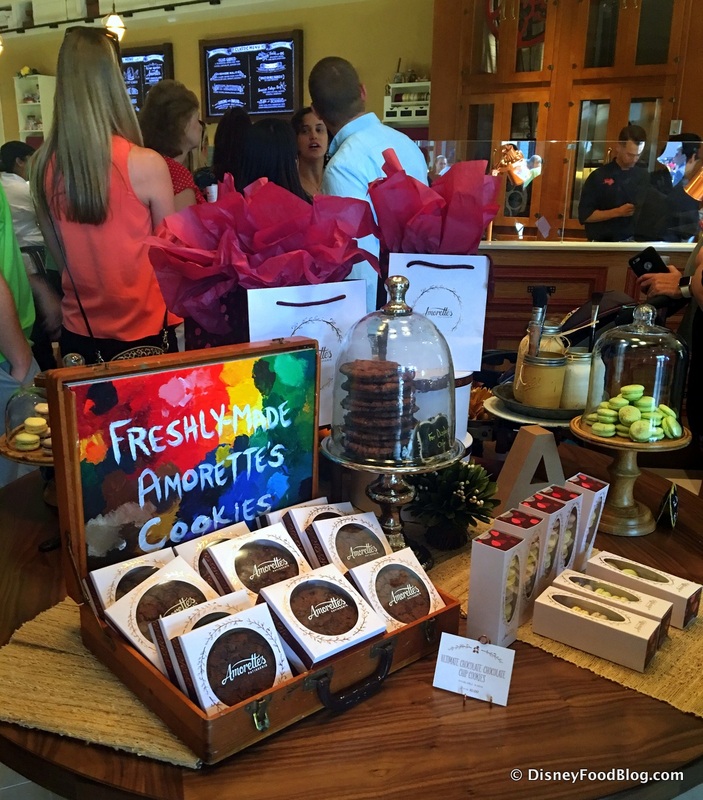 The round pedestal table directly below gives you a hint at some of the treats you can enjoy at Amorette’s. 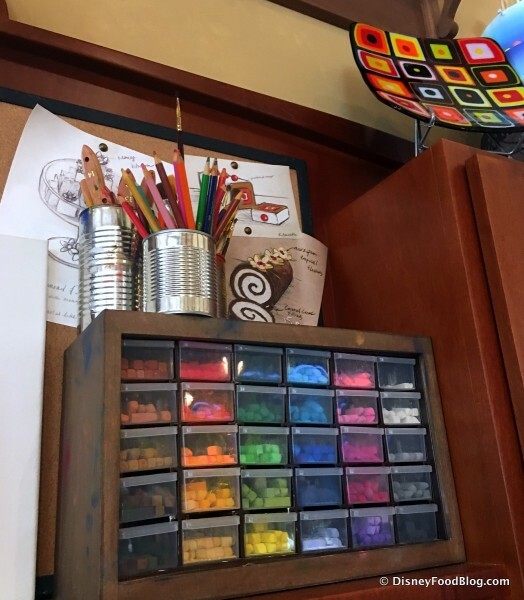 You can see the artistic references in the presentation — like the cookies in the artist’s paint box. Ultimate Chocolate-Chocolate Chip Cookies are packaged and ready to go, but you can also get them warm if you prefer. Macarons in a myriad of pastel colors also make a nice take-along treat. 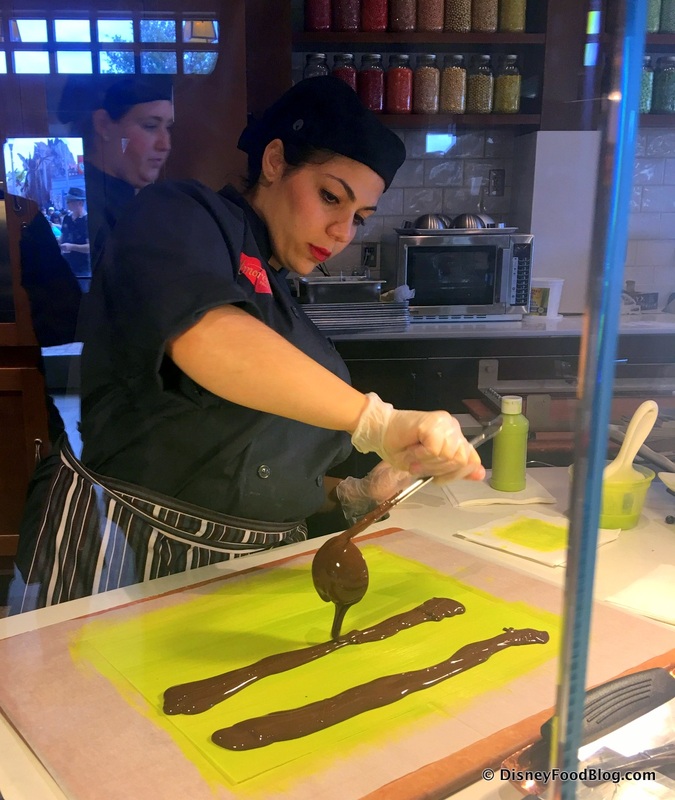 They come six to an order, and flavors include Cassis-Violet, Caramel Sea Salt, Pistachio, Chocolate, Passion Fruit, and Citrus. It’s an interesting aesthetic. 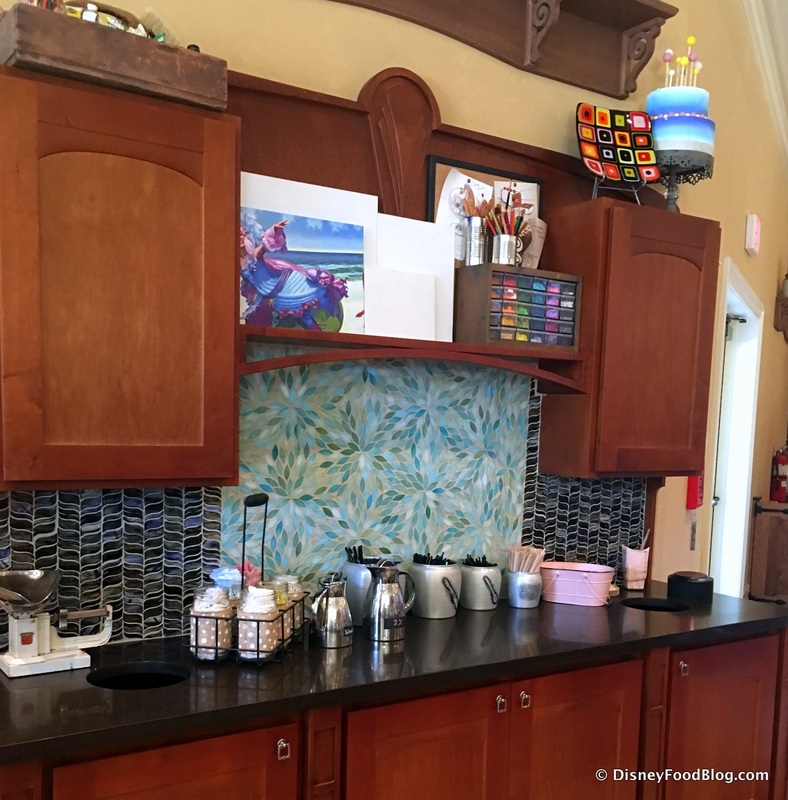 Bumped up against the vintage decor and pink packaging, you have surprising “pops” of color, like this display in the show kitchen area. Looks a lot like a collection of paints for the artists, doesn’t it? 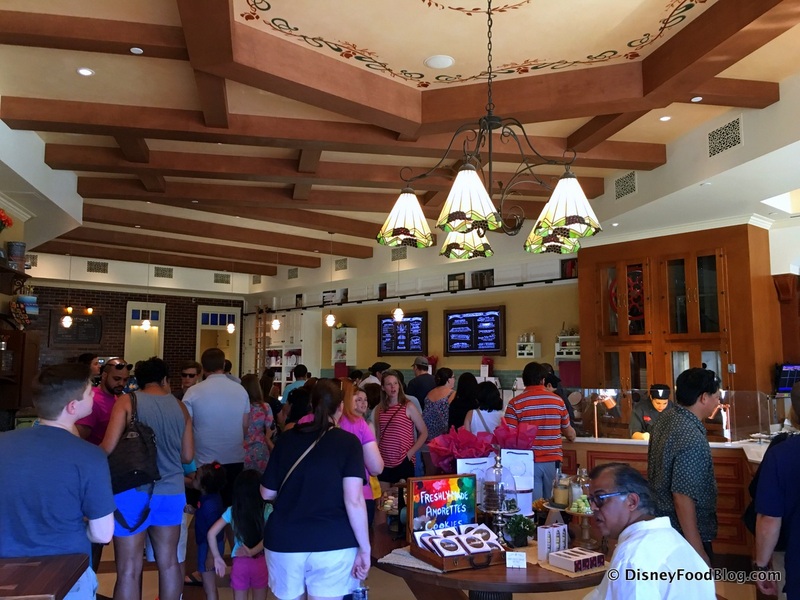 Beyond the main ordering area and to the left, you’ll find a separate counter for Beverages. Here, you can enjoy a variety of drinks. There’s milk for dunking cookies, of course. 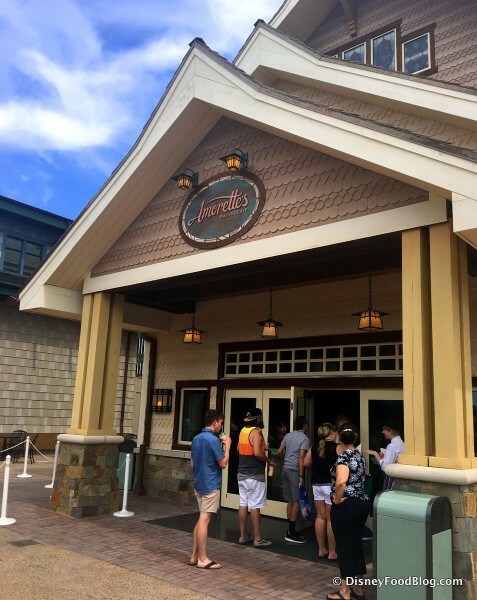 But there’s also a variety of Joffrey’s Coffee and Espresso. If you’re looking for dessert in liquid form, Amorette’s Hot Chocolate Ganache with Chantilly and Shaved Dark Chocolate will fit the bill nicely. Fix your coffee just the way you like it at the Beverage Condiment area, which sits to one side. 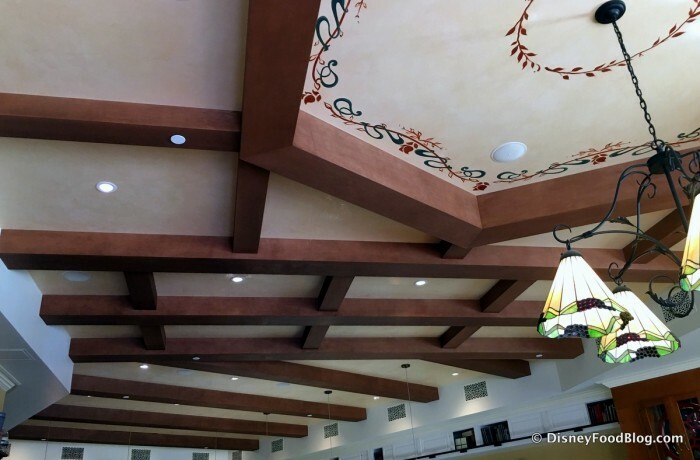 Check out the tile work! 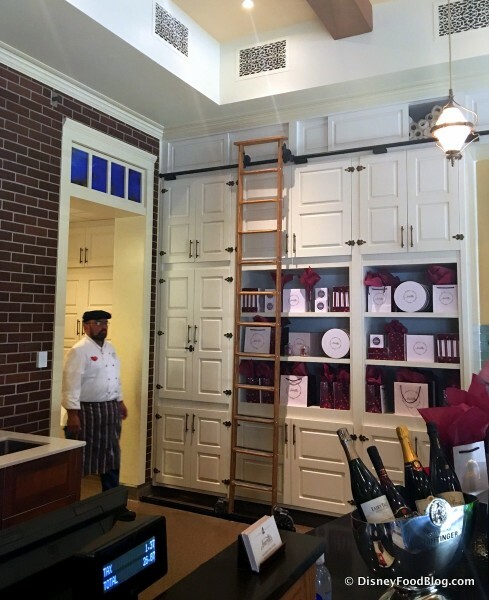 Or you can elevate your pastry experience with a glass of Champagne or Sparkling Wine. At present, they offer Taittinger Brut La Française, Iron Horse Fairy Tale Celebration Cuvée Brut, Nino Franco Rustico Prosecco, and Banfi Rosa Regale Sparkling Red. And — surprise! — there is seating here! 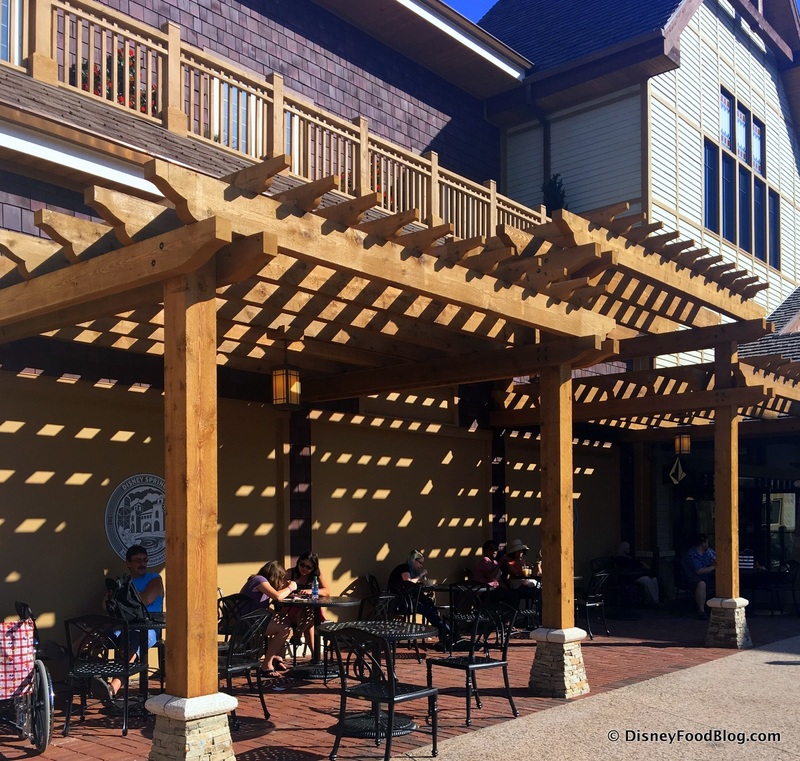 You’ll find actual tables and chairs, but there are also bars at which you can stand and snack. The set up is similar to what you find at Les Halles Boulangerie Patisserie in Epcot’s France Pavilion. There is additional seating outside too, if you prefer dining al fresco, and pergolas filter the light, especially as the sun is setting. Back inside, you might be wondering how it all works! 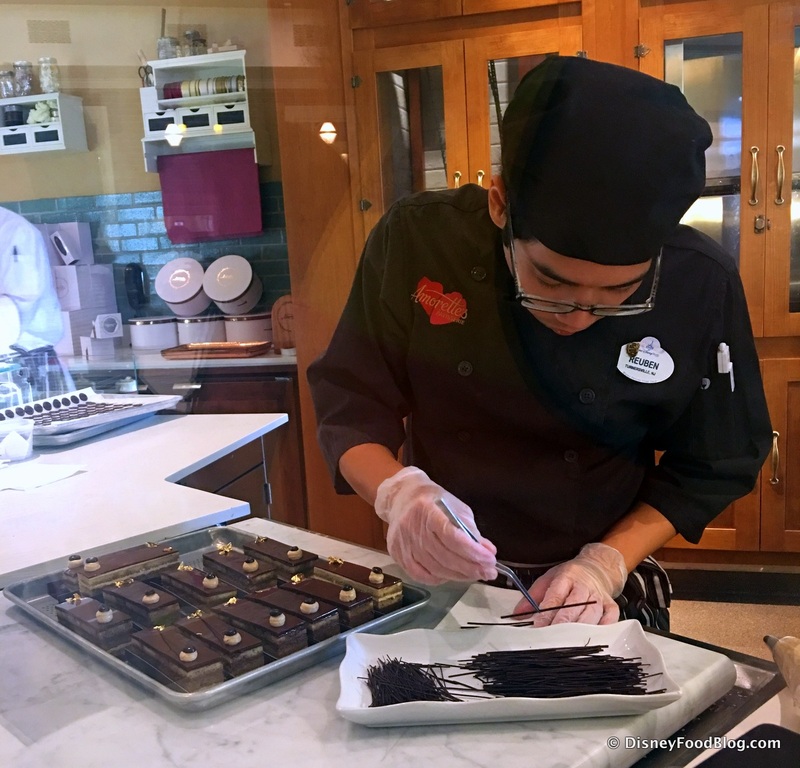 Let’s take a little tour of the show kitchen and pastry cases to get a feel for things. 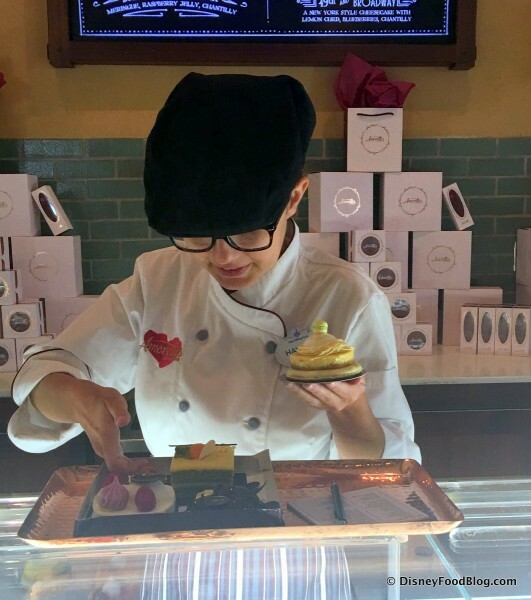 Speaking of the Show Kitchen, it’s an extra special treat to watch the pastry team put together these edible masterpieces. 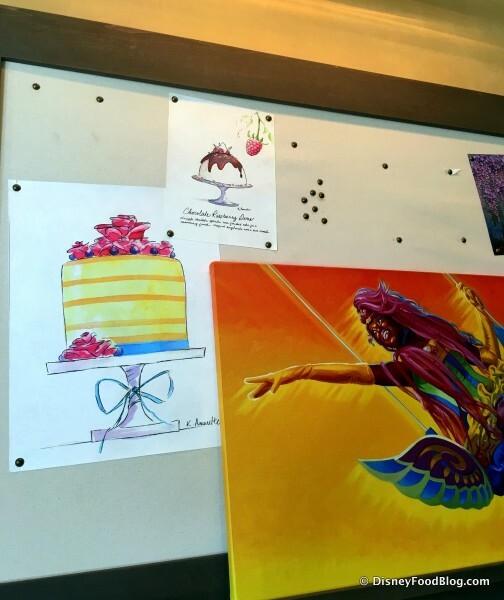 This place really is equal parts art studio and bakery. 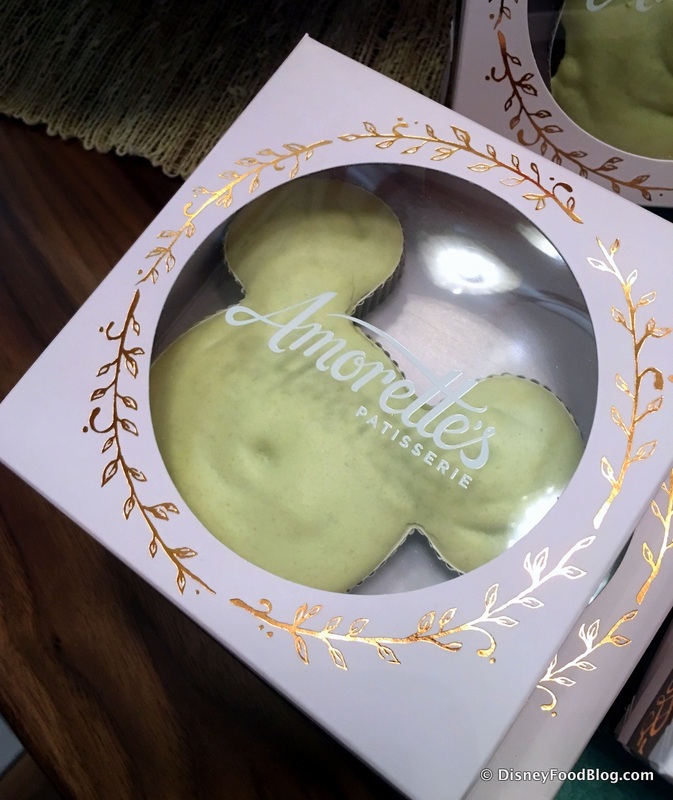 While watching the action, we spied Amorette’s Signature Cake on display. To assist us in ordering on opening day, the bakery actually had card stock menus, so I snapped pics of them for you to see all that’s available. It’s a lot to take in, so we’ll take them as they come. 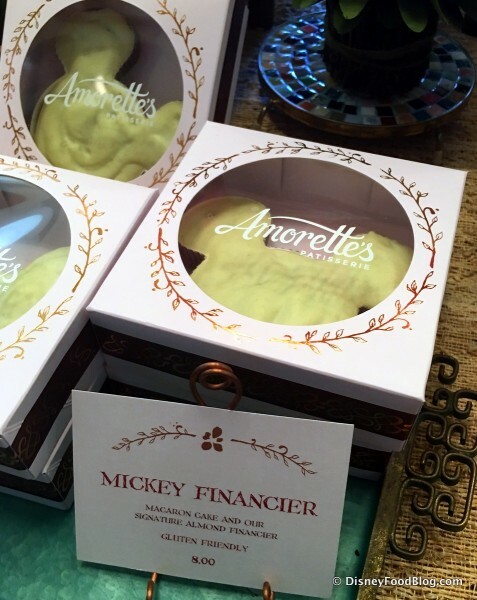 We’ll start with the Mickey Financiers. 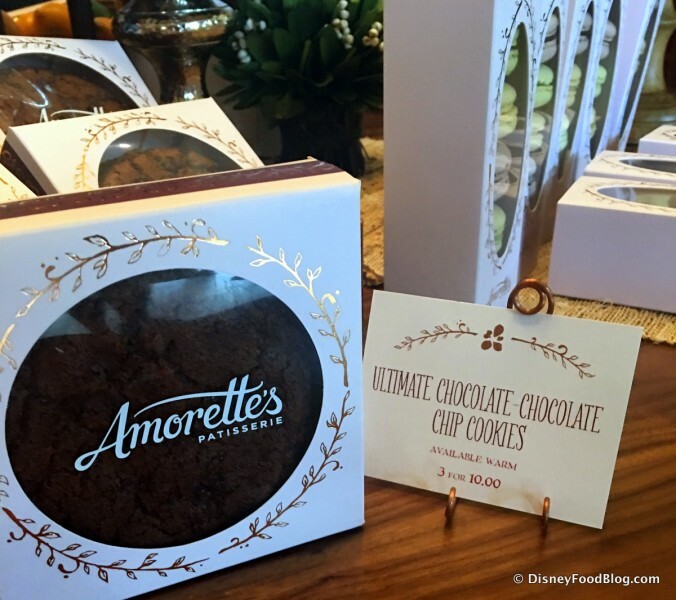 Like the Chocolate-Chocolate Chip Cookies we spied earlier, these are boxed up and ready to go for guests who are looking for a pastry fix tout de suite. 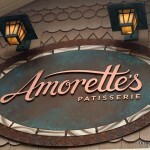 Diving into the large bank of refrigerated pastry cases, it’s important to note what you will not find at Amorette’s. 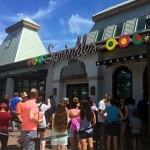 This is not a Disney Confectionery stop like Big Top Treats, Sweet Spells, or Zuri’s Sweets Shop. 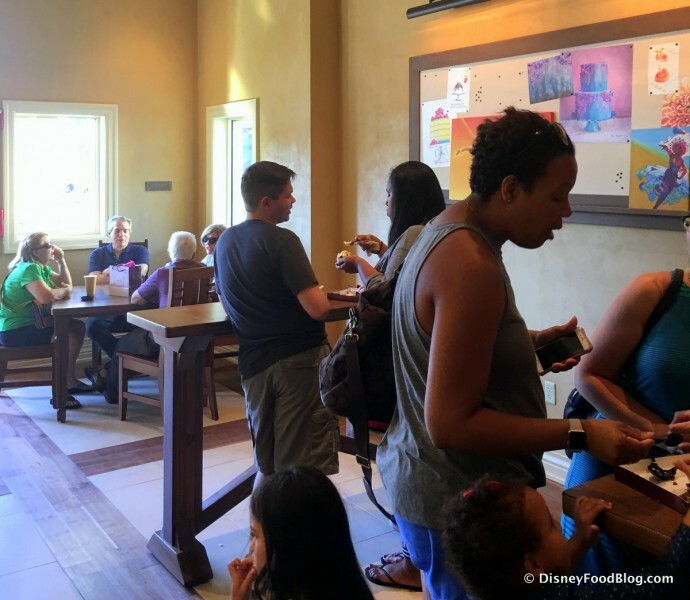 There are no Caramel Apples (Mickey or otherwise), Marshmallow Wands, Krispies, or other familiar treats. Likewise, you won’t spy boxed “generic” Disney candies for sale anywhere. For now, anyway, they seem to be staying true to the story. Yep, there are some Mickeys (and Minnies), but they’re all woven into the ethos of the spot. 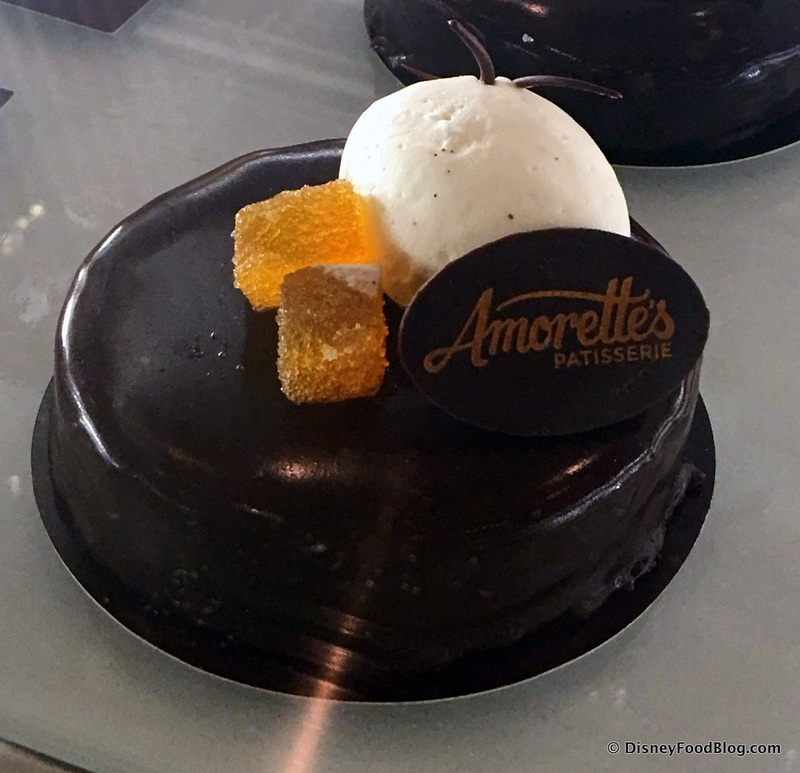 As promised, Amorette’s is more than just a stop for a pastry. The shop also creates large cakes. We saw a few different varieties on display while there. The Macaron Cake is a showstopper. 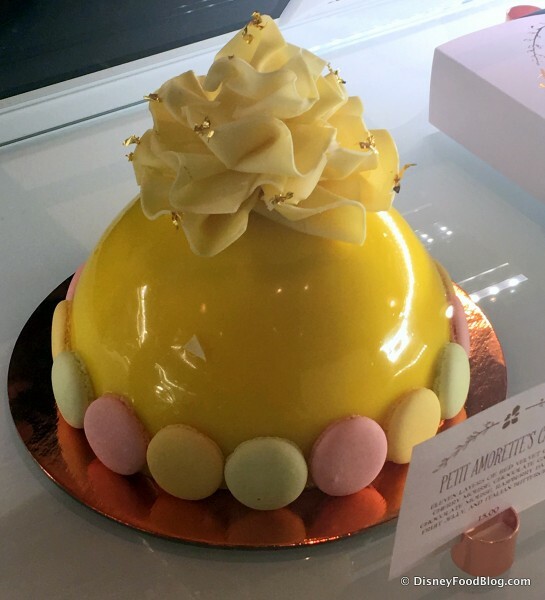 Featuring Lemon Chiffon Cake, White Chocolate Mousse, Raspberry Pate de Fruit Jelly, and Italian Buttercream, the cake is trimmed with Macarons and topped with a Gold Leaf-Flecked Rose. How much would I love to see inside this one! 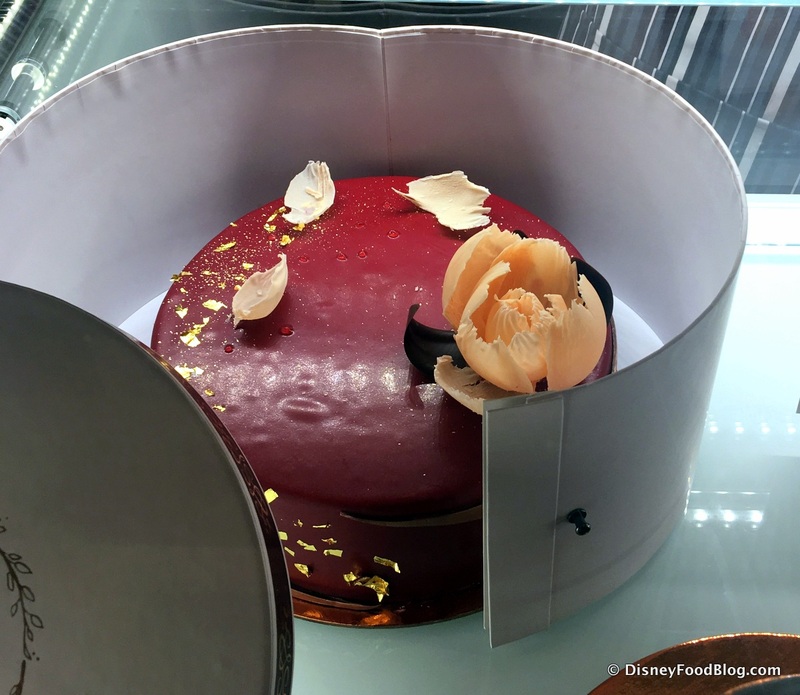 We also caught a glimpse of the shop’s Signature Cake, boxed up and ready to go. Which one do you want to try first? We can’t decide! While we’re all deliberating, we’ll check out the individual desserts. Many come with whimsical names that sound like (surprise!) 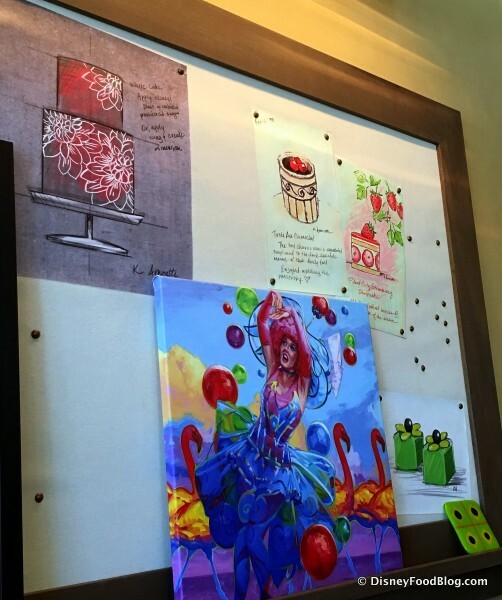 paintings. For purists out there, there’s the 49th and Broadway — N.Y. Cheesecake. It’s dressed up with Lemon Curd, Blueberries, and Chantilly. 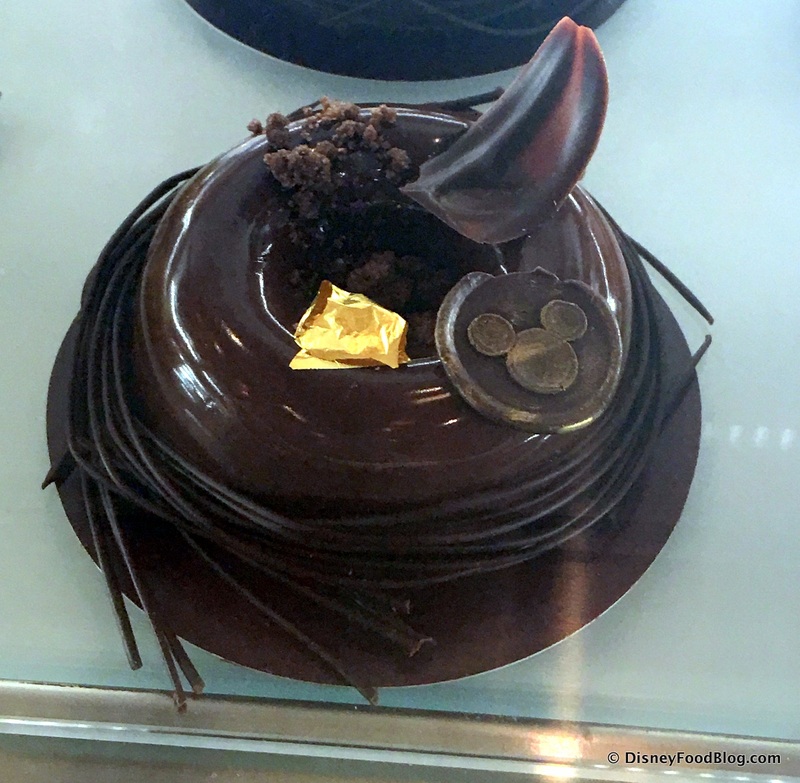 Next, you can savor the Avant-Garde, a Chocolate Mousse with Chocolate Chiffon Cake. 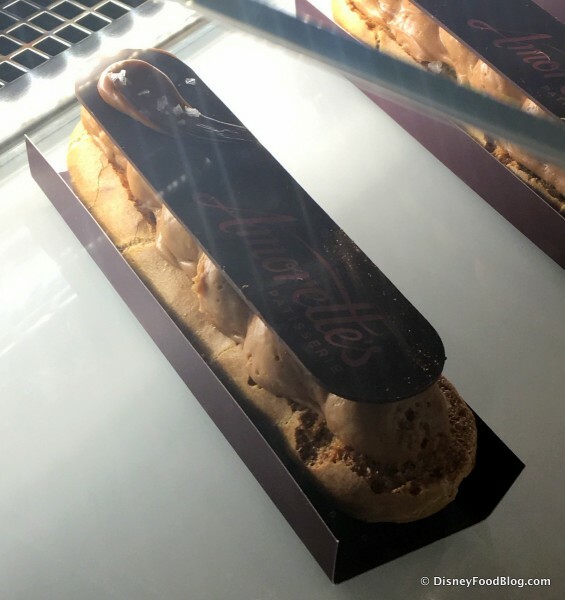 We spied a Caramel and Coffee Eclair, but the menu hints that other flavors will be available. 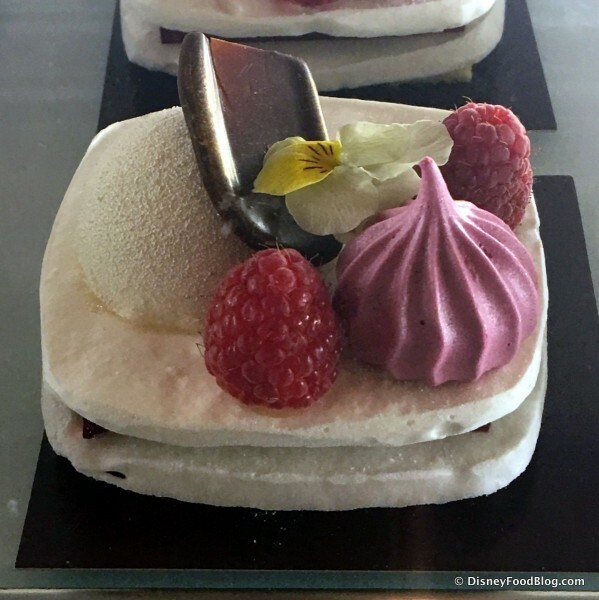 Dancing with Pavlova is as delicate as a ballerina, and offers Meringue Crisps sandwiched together with Raspberry Pate de Fruit Jelly. The dramatic Palais Garnier is Chocolate Opera Cake with layers of Almond Cake, Chocolate Ganache, and Coffee Buttercream. 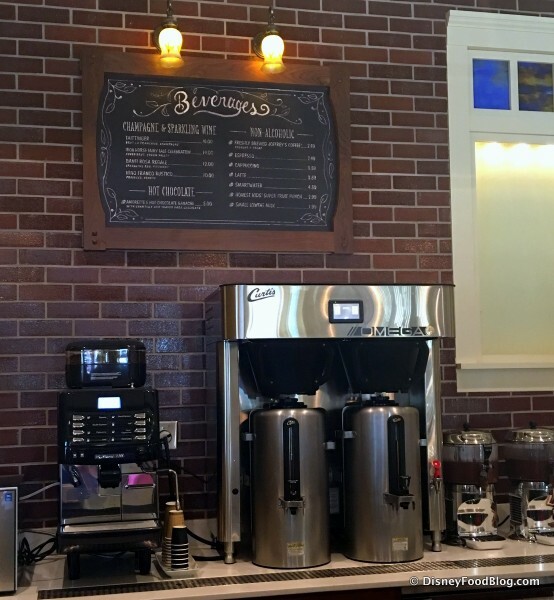 But Reflections in Memphis is the answer to your salty-sweet cravings. 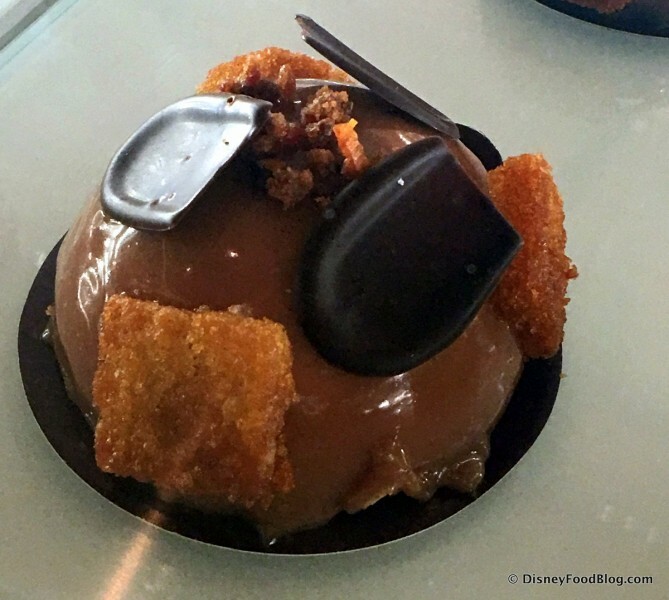 The dome-shaped sweet includes Peanut Butter Mousse, Toasted Cake, Banana Pate de Fruit Jelly, and Caramelized Bacon. Is this the new King Cupcake, do you think?? Sunrise Tokyo Bay features some wonderfully unique flavors. This Yuzu Chiffon Cake includes Green Tea, Yuzu Jam, and Mandarin Orange. The Viennese Waltz is Amorette’s take on another classic confection, the Sacher Torte. 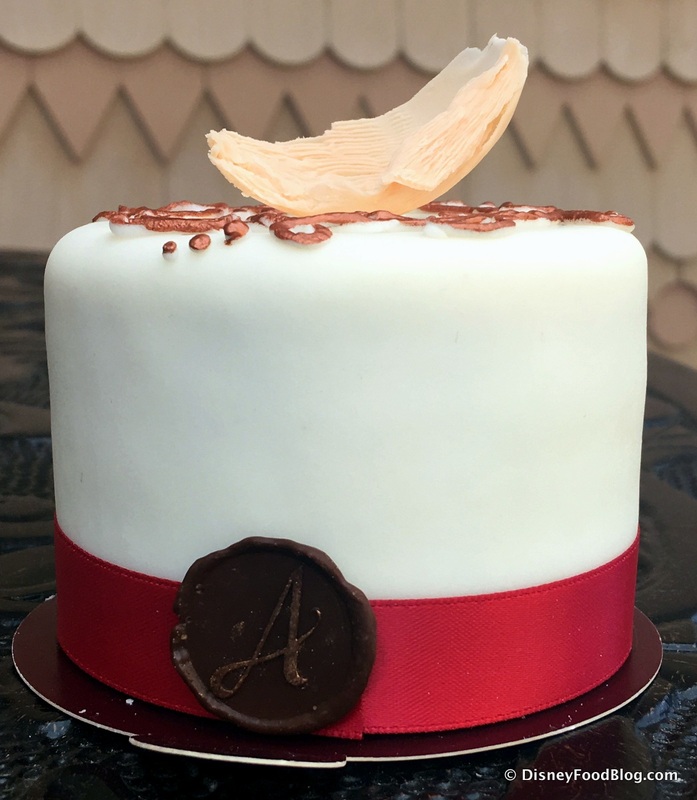 This version stays uber true to tradition with Chocolate Almond Financier Cake and Apricot Jam! I’m so excited to see this. Strawberry Fields of O.C. will have strawberry-lemon lovers singing for sure. This square offers Lemon Curd, Strawberry Mousse, and Basil Sugar. 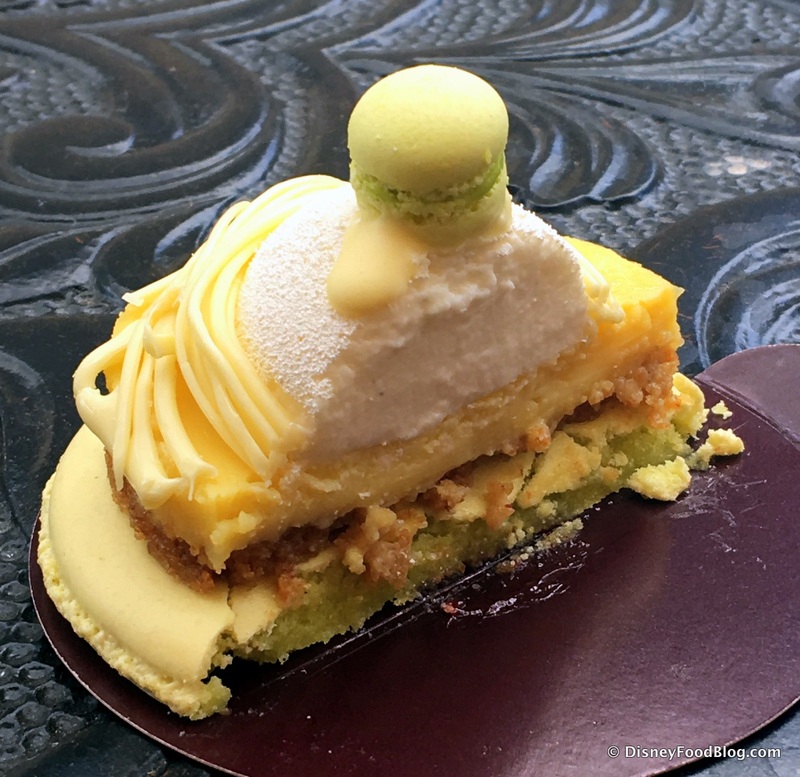 For our final treat, we travel to the Southermost Spot in the U.S. and pay homage to Key West with the Sunset on Mile Marker 0 Key Lime Tart. 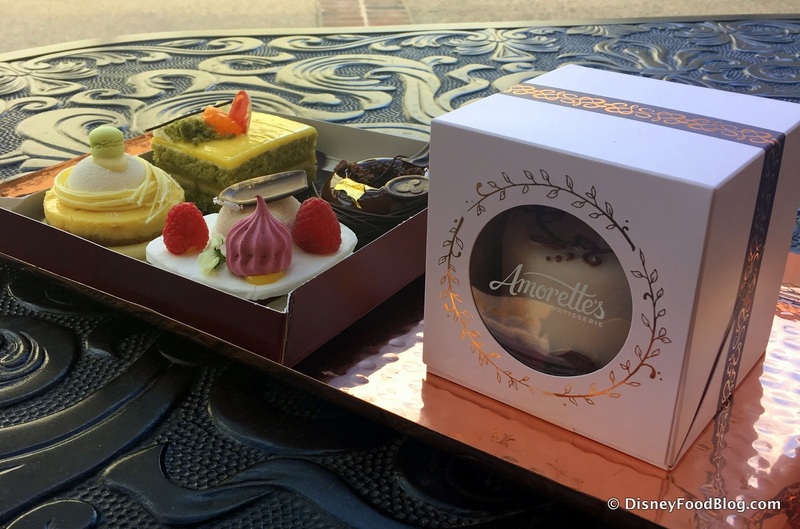 Here at Amorette’s it’s a lot like the set-up at the Ganachery — a cast member guides you through the process like a personal shopper. Lemme tell you — it wasn’t easy to make decisions! Since I was “eating in”, I was handed my order on this beautiful hammered copper tray. It was a nice touch. Since it was still pretty crowded in there, I headed outside where the light was better and it was a little quieter so that I could enjoy my treats. 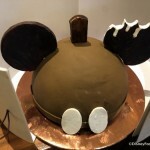 I started with the Avant Garde — Chocolate Mousse. Deep, rich, and chocolatey, this is definitely going to hit the spot for chocolate fanatics. One word of advice, though — don’t plan to take this one home with you. The mousse isn’t going to stand up to the Florida heat for long. 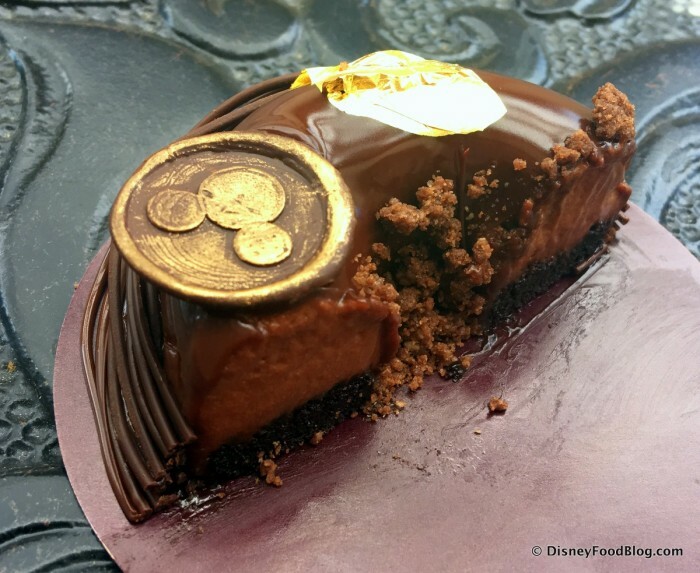 We loved the nod to the Big Cheese on the gold medallion. This one is suuuuuuper rich, and you’re definitely going to get the hints of coffee here. 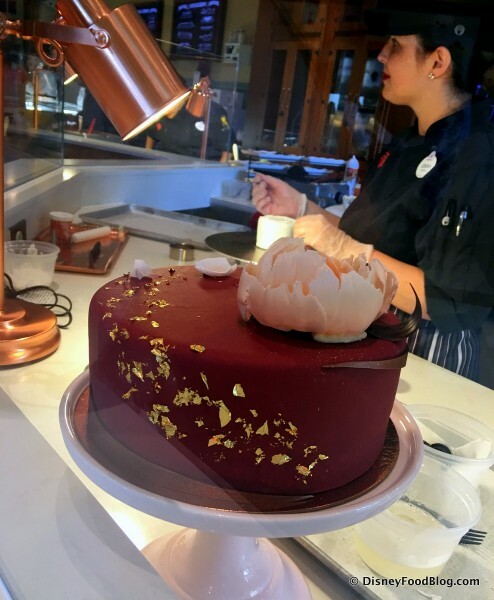 Plan to share it if you don’t want chocolate overload. 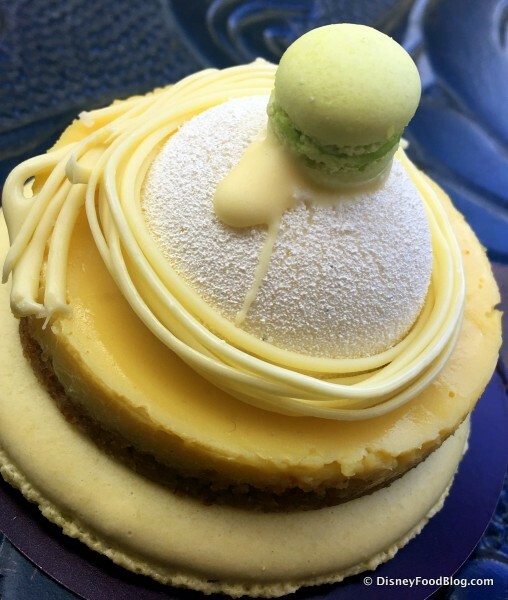 But you know we’re lovers of Key Lime here! So we had to represent and get the homegrown choice. 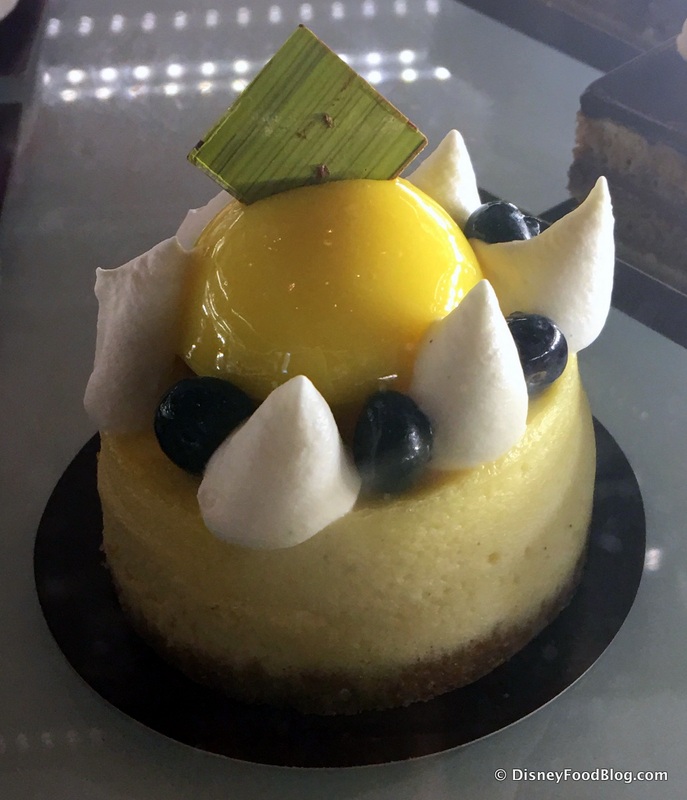 🙂 Sunset on Mile Marker 0 is a lovely upscale tribute to this classic dessert. 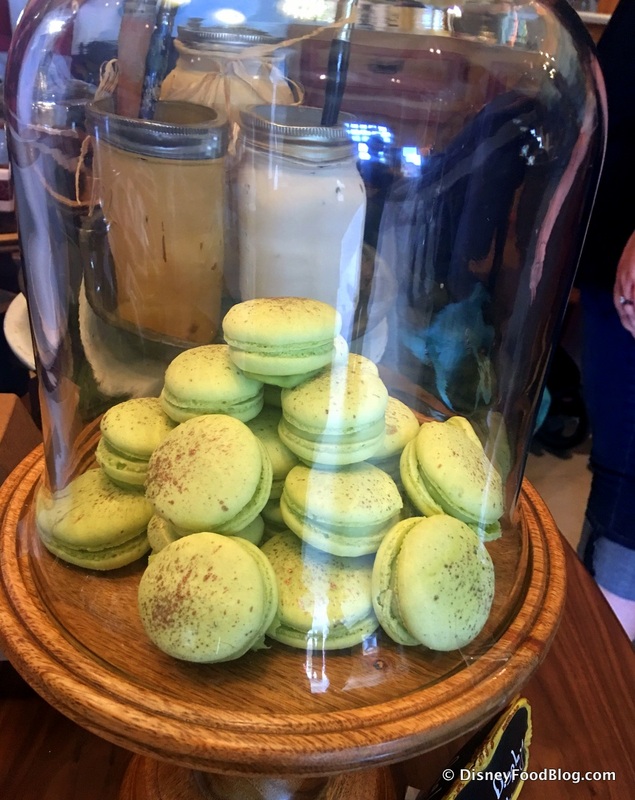 Besides, that tiny Macaron on top is too cute to pass up! 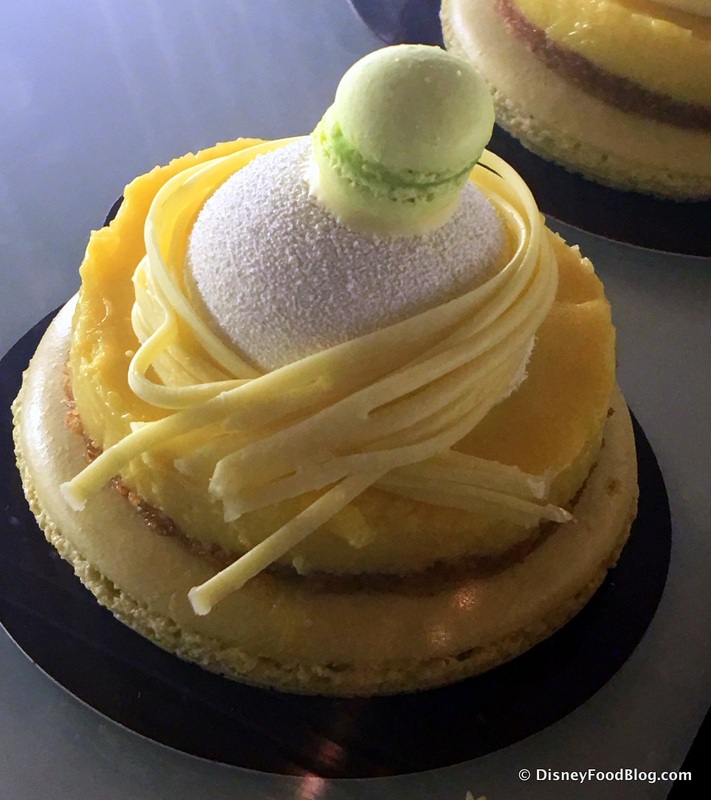 The light and crispy Macaron base and Graham Cracker Crust made this extra special, and the rings of sweet White Chocolate garnish complemented the strong and tangy lime nicely. Speaking of Meringues (not AJ’s favorite, but we digress 😉 ), the Dancing with Pavlova was definitely very pretty. 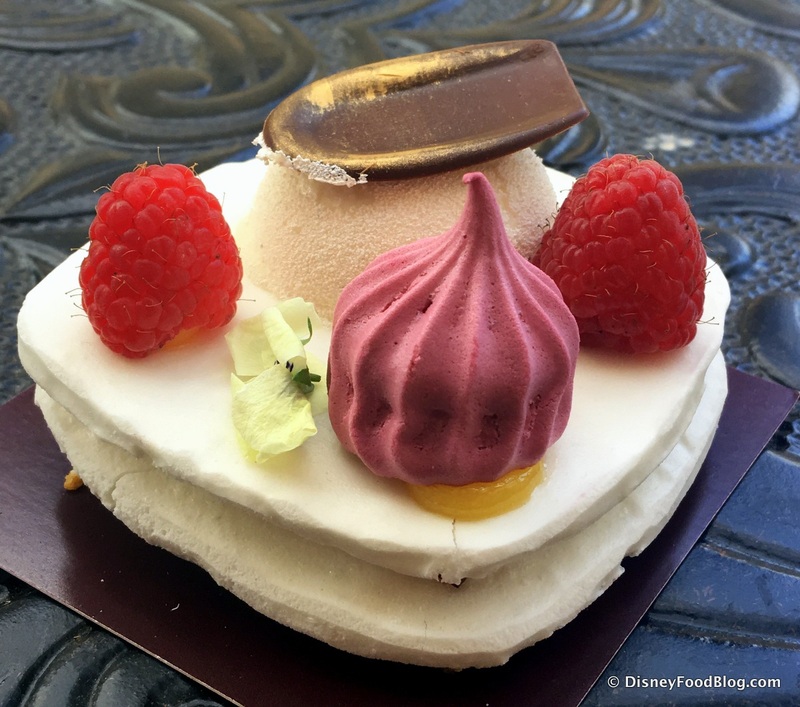 The airy light dessert is perfect for someone who likes just a whisper of something sweet. With no overtly rich components, you definitely won’t feel weighed down with this one. It’s your ethereal choice. We couldn’t resist the chance to sample Sunrise Tokyo Bay, which brings together the tang of Yuzu (an Asian Citrus Fruit that tastes a lot like key lime) and the herbal grassy notes of Green Tea. 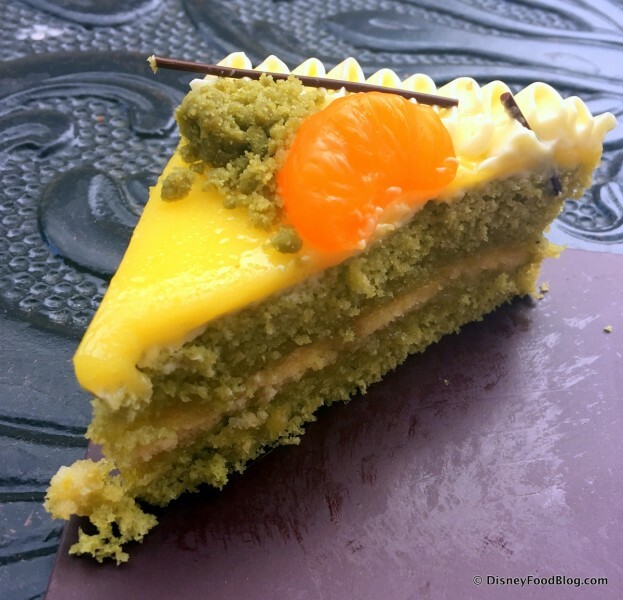 Matcha lovers will dig this one, because those flavors are VERY strong. But the more I ate, the more the other flavors balanced out and came through. It was a showstopper both in terms of looks and taste. 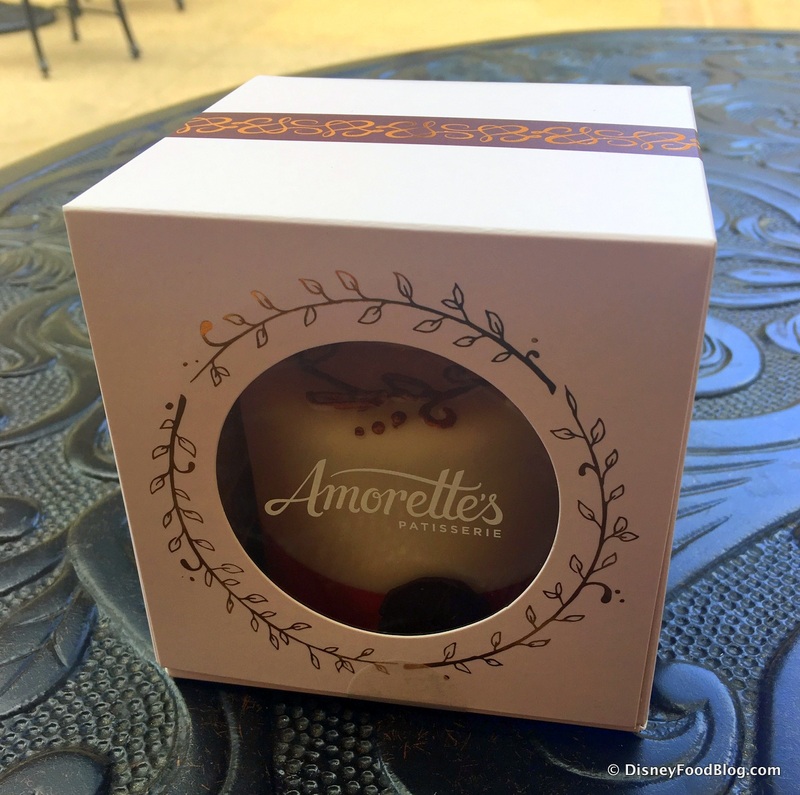 While it would have been wonderful to dig into one of Amorette’s large cakes, you guys weren’t there to help me. 😉 And so, I settled for the Petit version. 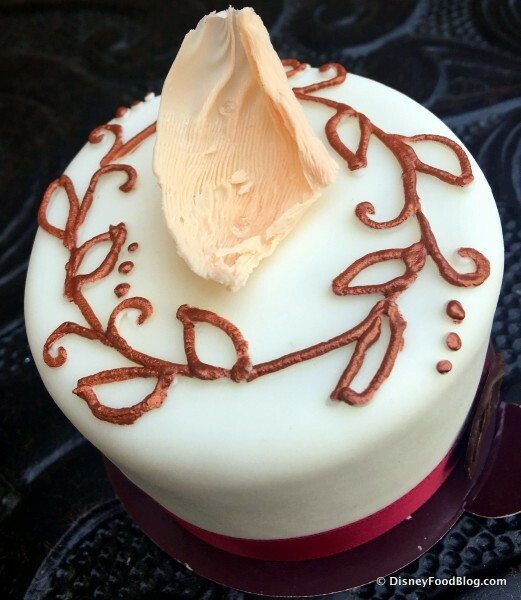 The small version of the signature cake is enrobed in Fondant, but it’s Vanilla, rather than the Hibiscus Fondant that covers the larger version. The covering is pliable and delicious — not stiff or dry like I was afraid it would be. 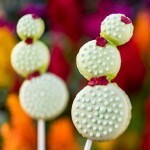 And I love the beautiful decoration, including the White Chocolate Rose Petal. 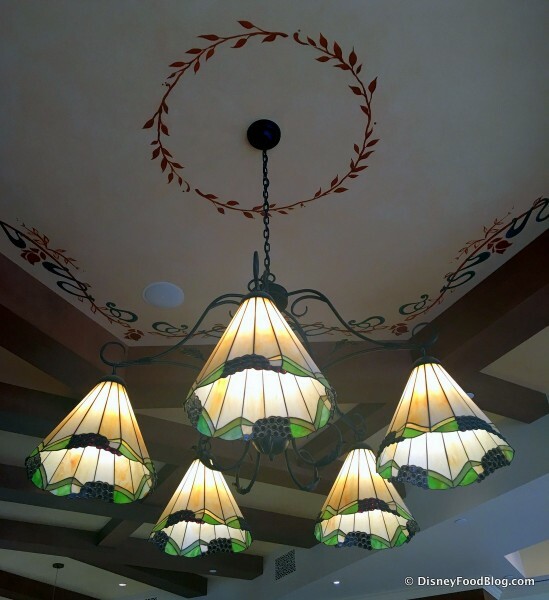 The piping is the same design you’ll see throughout Amorette’s in the decor and touches. A ribbon trims the base, and it’s secured with a Chocolate Seal bearing the shop’s initial. But cut into it, and you see the real drama. 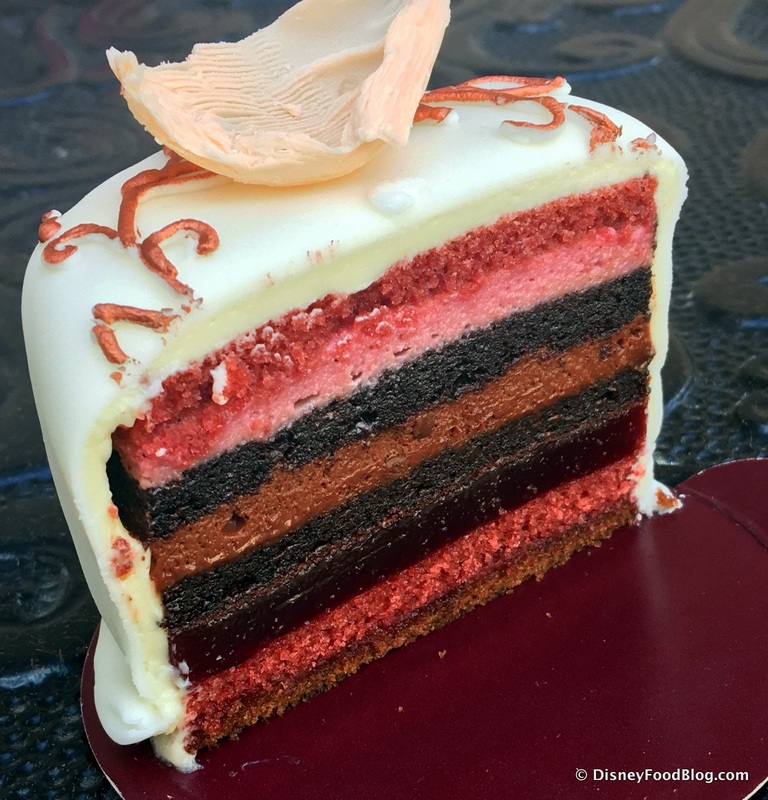 There are those lovely layers of moist cake, mousse, and jelly filling. 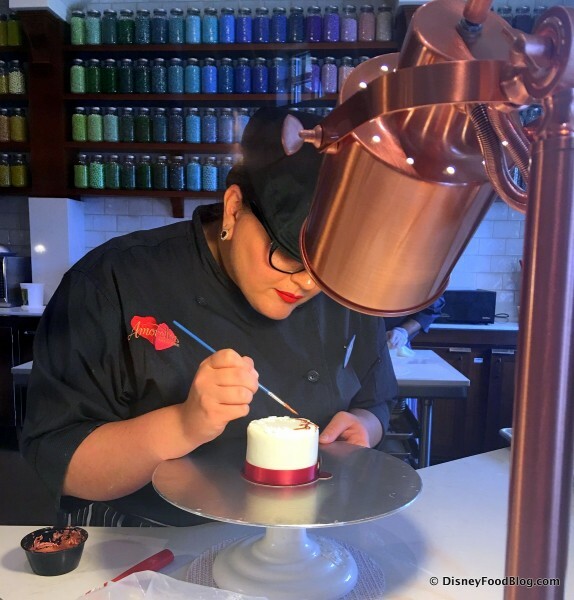 A thin layer of Buttercream helps the fondant to adhere to the cake. The large version of this cake has 11 layers, and this one looks to have about 9 or 10. This petit cake was absolutely my favorite thing I tried. 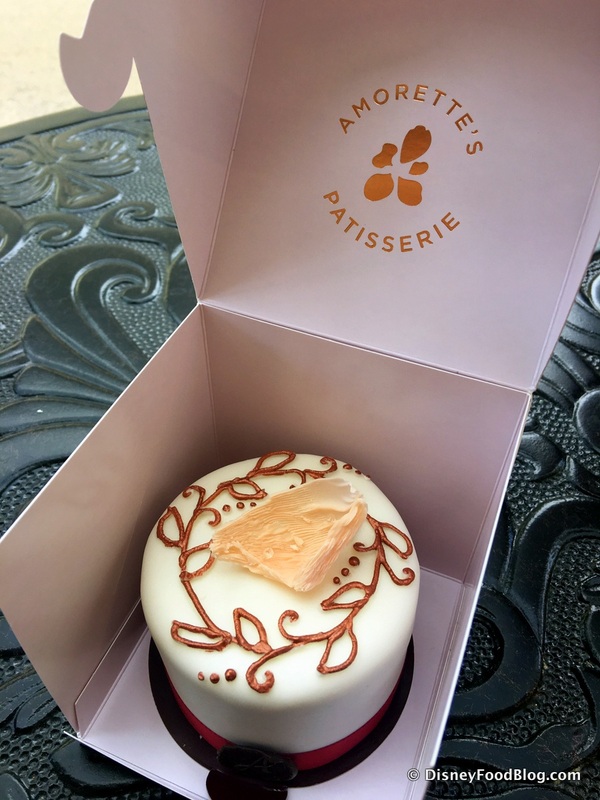 And don’t let its demure size fool you — it’s so rich, you’re gonna want to share. As we wrap up this first visit, we’ll go over a few housekeeping items. 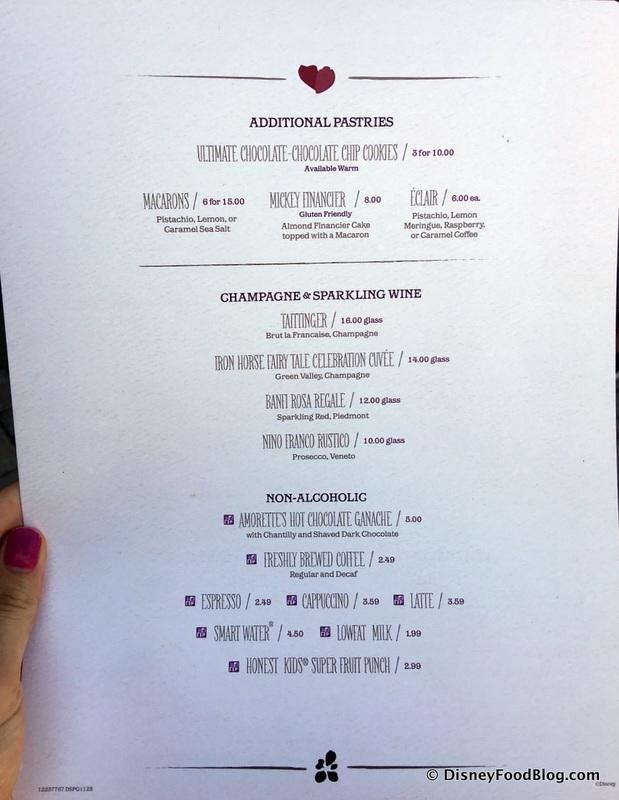 At this point, it looks like only non-alcoholic beverages are available on the Disney Dining Plan. 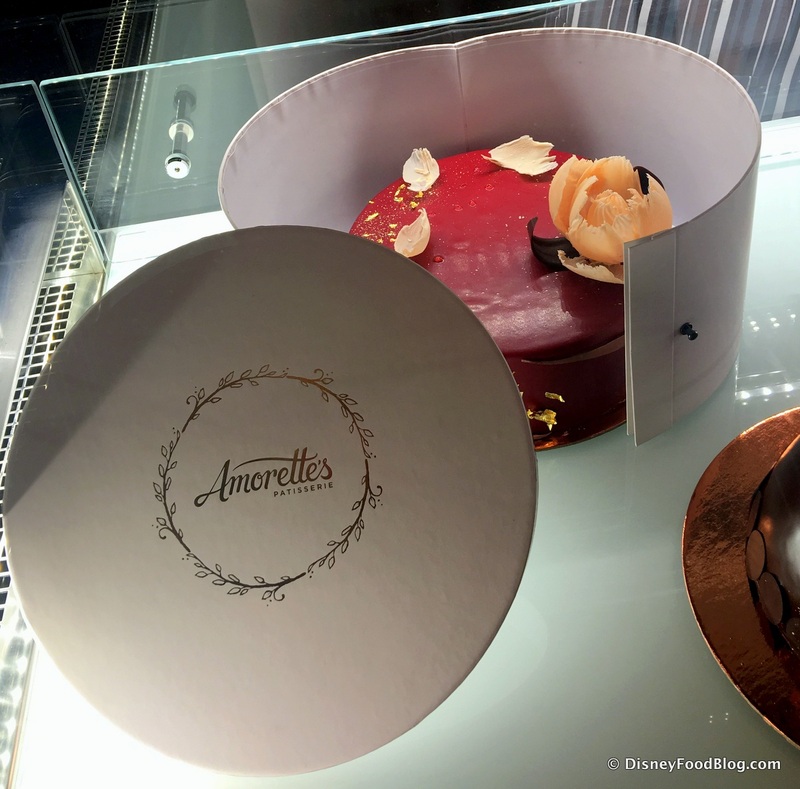 Also, while there were a few large cakes on display when we visited, you’ll want to give Amorette’s 72 business hours advance notice when ordering a cake. 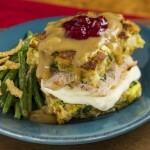 To order, just call 407-934-3500. 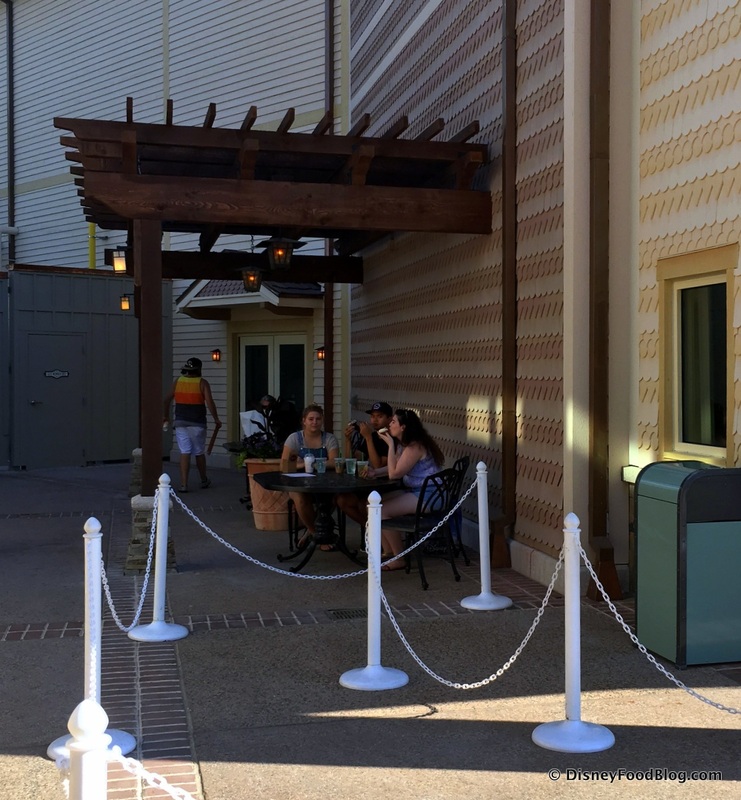 Cast Members let us know though that they hope to have online ordering available within the next six months or so. 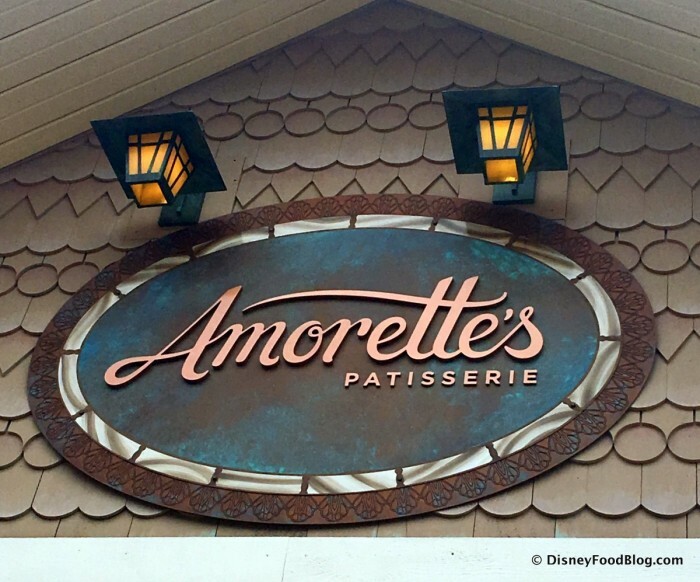 Will you be visiting Amorette’s during your next trip to Disney Springs? Leave a comment and tell us what looks good to you! I went yesterday and have to agree that sunrise tokyo bay was delicious the flavors balanced out after a bite and just yum! My cast member talked me into the hot chocolate and I was afraid it would have been too much dark chocolate for me but the orange and the cream made this delicious! i really dont like the drinking chocolate from ghiradellhi during food and wine but i would for sure get this again. WOW. What artistry! Thanks for taking so many pics. I’d sure like to try that mini cake and the Mickey dome cake! Thanks for the review and pictures! 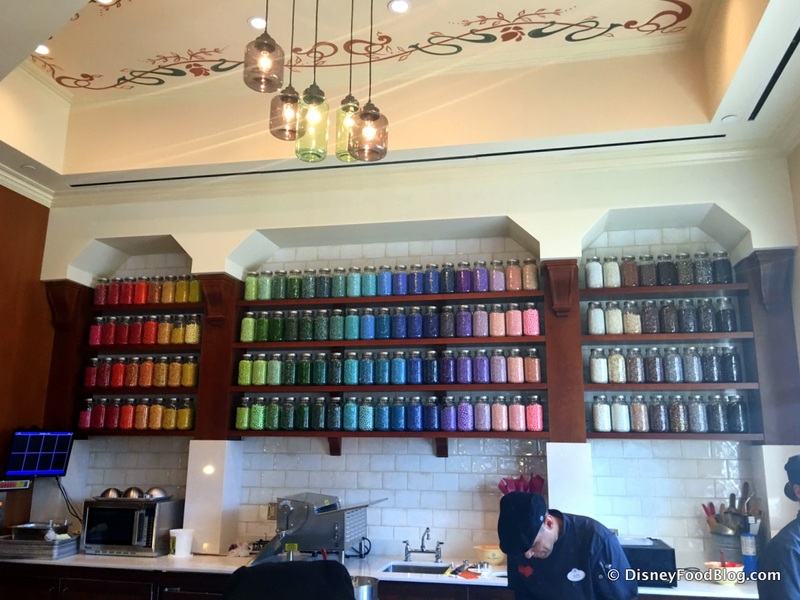 It’s so nice to see a different kind of sweets/dessert shop at WDW. These treats bring back memories of my time studying Pastry in culinary school. I can’t wait to visit! 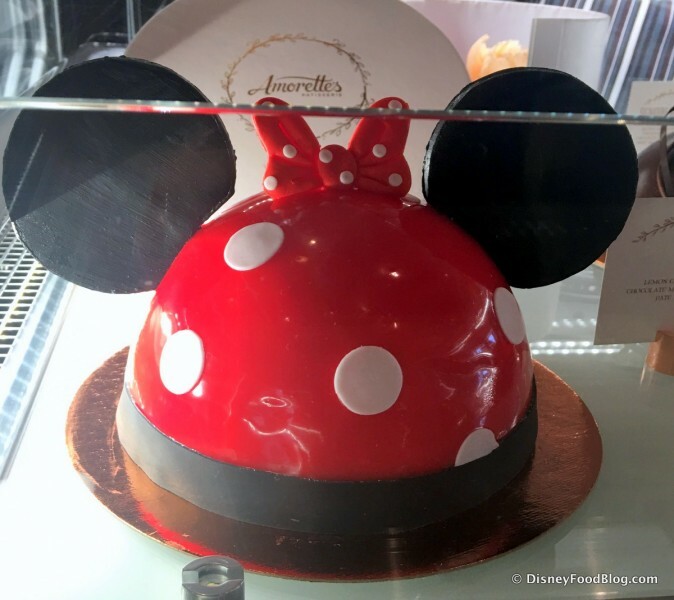 Think they’ll deliver a cake to the Yacht Club for my daughter’s Sweet 16 birthday next month? Hope they are as tasty as they look. My eyes and those of my husband are now the size of that petit cake. 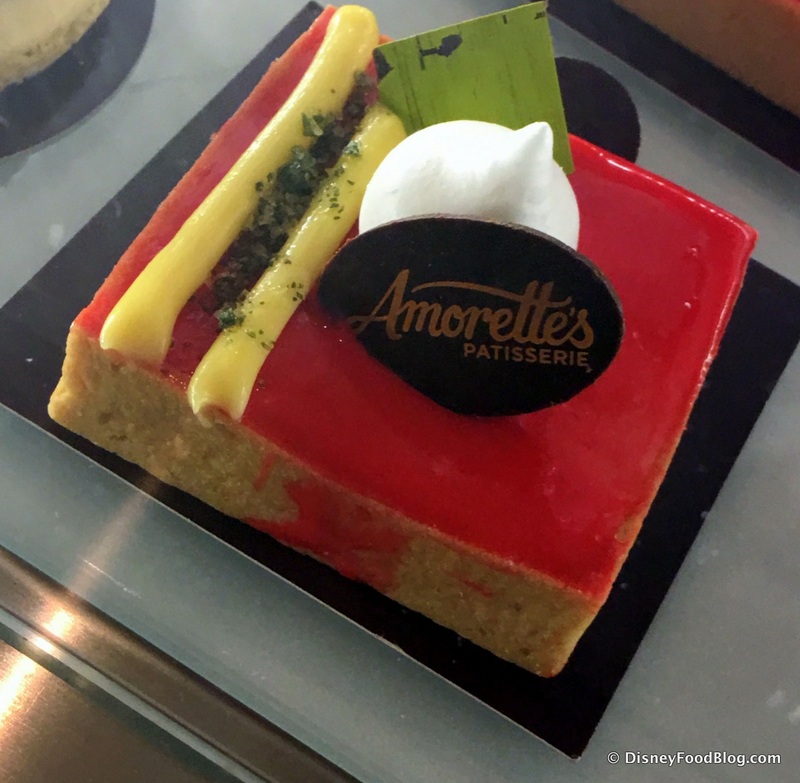 I think we are going to plan our next trip to WDW just to try the Amorette’s Signature Cake. And given that we live diagonally across the country in Seattle, that means we are IMPRESSED. I would love to try one of each. Thanks so much for this fantastic article. Full of details and beautiful photos. 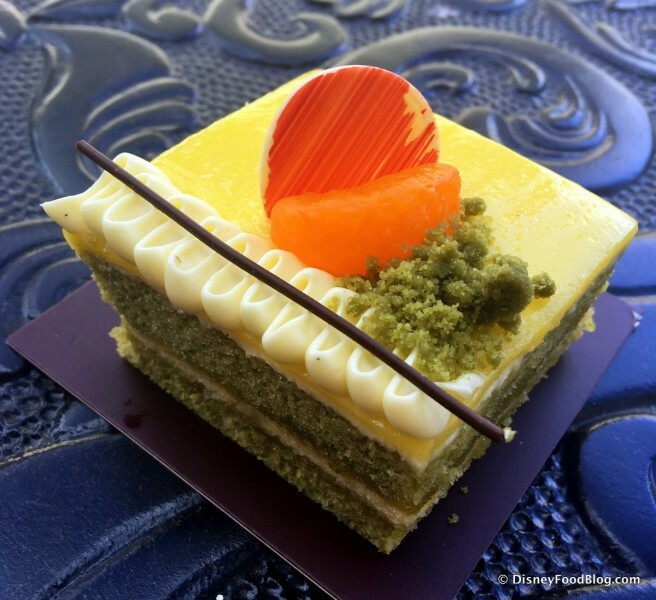 i was wondering if you could elablorate a little more on the taste of the signature petit cake? Absolutely fabulous works of art!!! GS — I’m not sure about delivery, but ordering should be available starting next week, so we should know more then. We’ll keep you posted! I’m already anxious trying to decide which ones I will try. Everything looks incredible. I think I’m actually starting to get overwhelmed by all the new options! 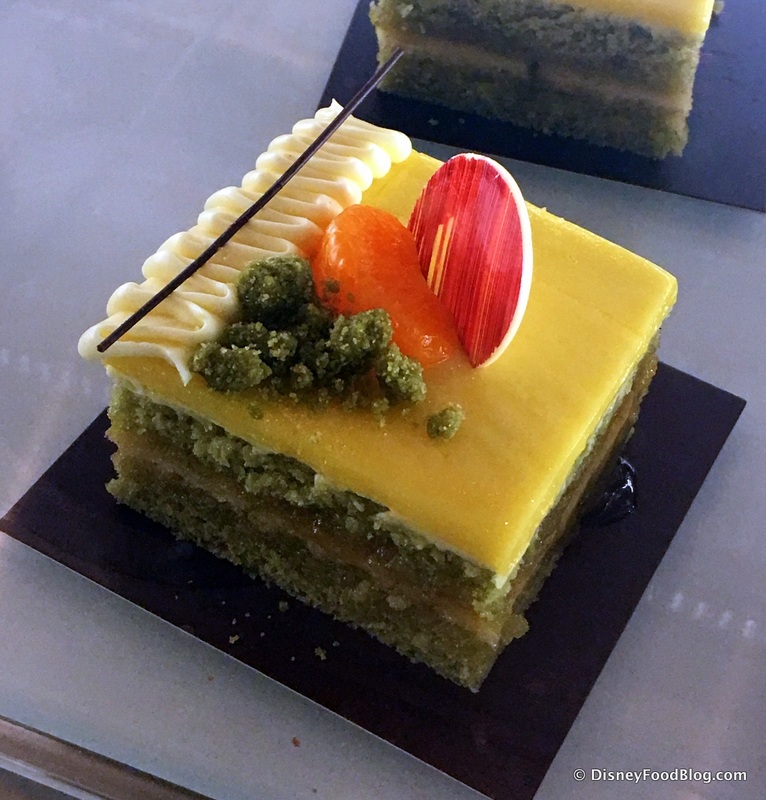 That signature cake looks amazing, but that one with the matcha is definitely my pick. 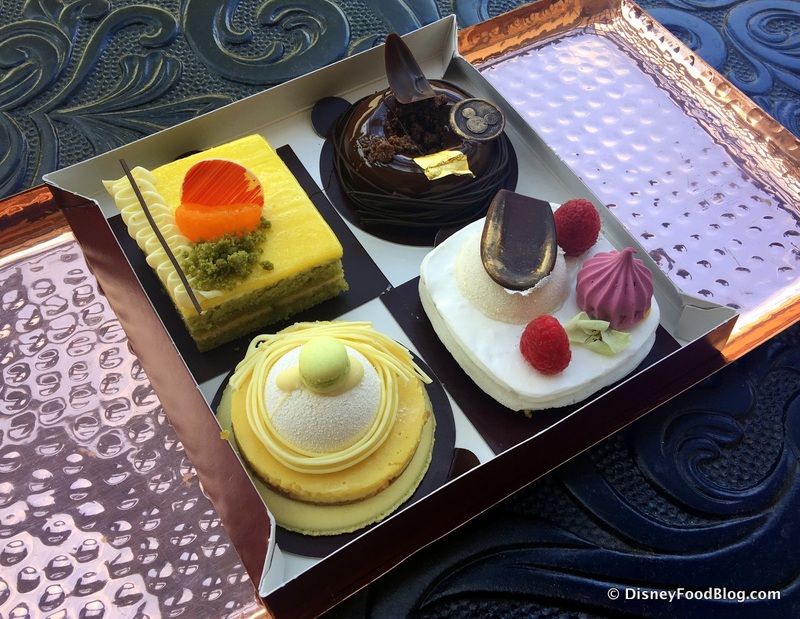 I’m going in Sept for the big 30th bday — perhaps I’ll drop a hint to my loved ones to consider ordering a cake! Just kidding, I’m not that narcissistic…but I will definitely make sure we stop here! Can you give us an idea of how many some of these beautiful treats serve? 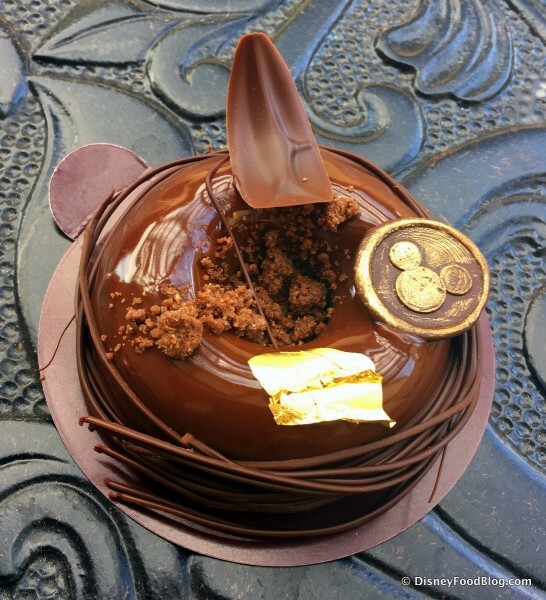 How many people could share one of the character dome cakes? 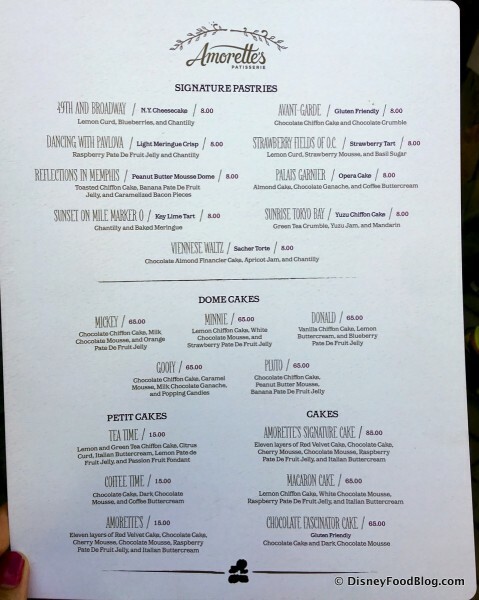 What about the cakes and petit cakes? Thanks. This place is amazing. 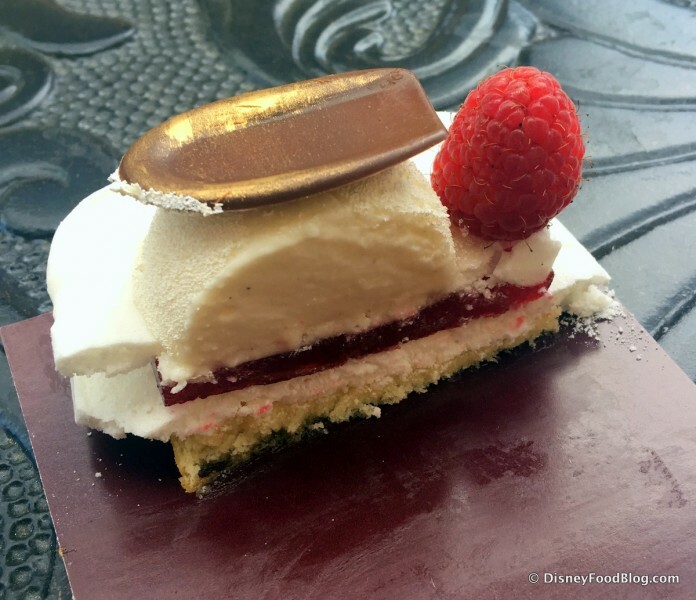 I bought the cheesecake and thought, geez $8.00… it was worth EVERY penny! Amazingly delicious. Will definitely go back and try other items. The macarons USED to come 6 to a box for $15, as your review shows. 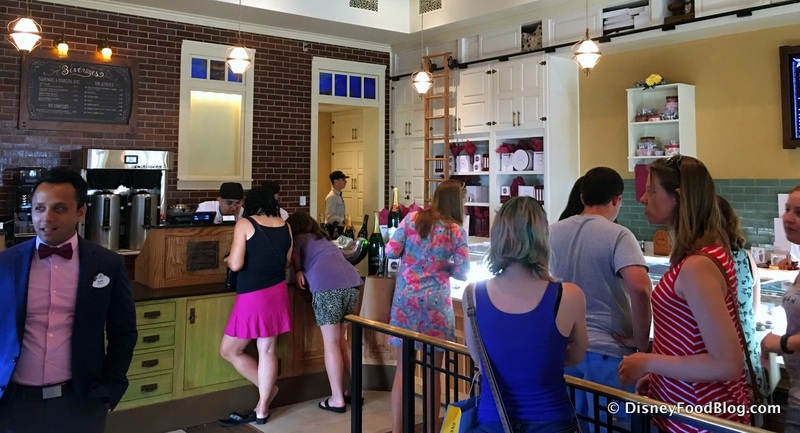 I’ve visited about 10 times so far because I love macarons. But when I went last night, the boxes had only 5, and a new sign said 5 for $15! I asked the server, and she said the boxes I had bought with 6 must have had an accidental extra. Um, I can count, and besides, on each box it was written exactly what was inside. One had 2 lemon, 2 caramel and 2 pistachio. 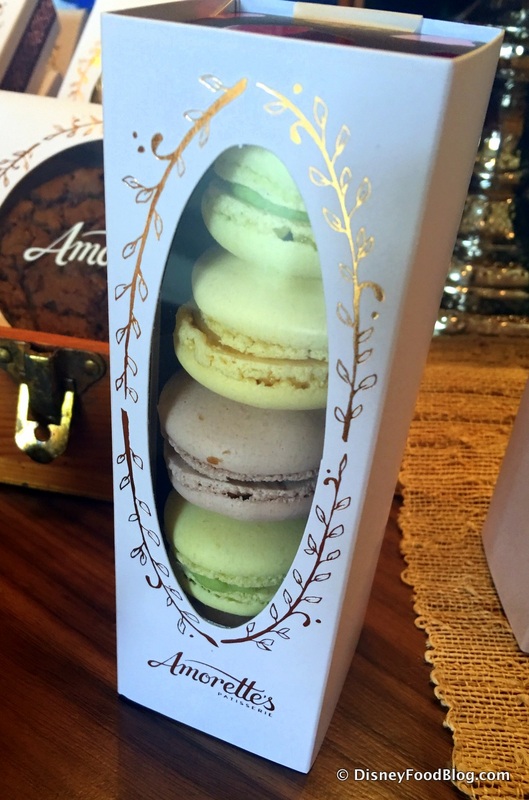 One had 4 caramel and 2 pistachio… Anyway, the boxes are sized for 6, and now with only 5 in there, one tilts over in the extra space. These are much better than Epcot’s, but wow, what a quick quantity switcheroo. They haven’t even been open 3 months! 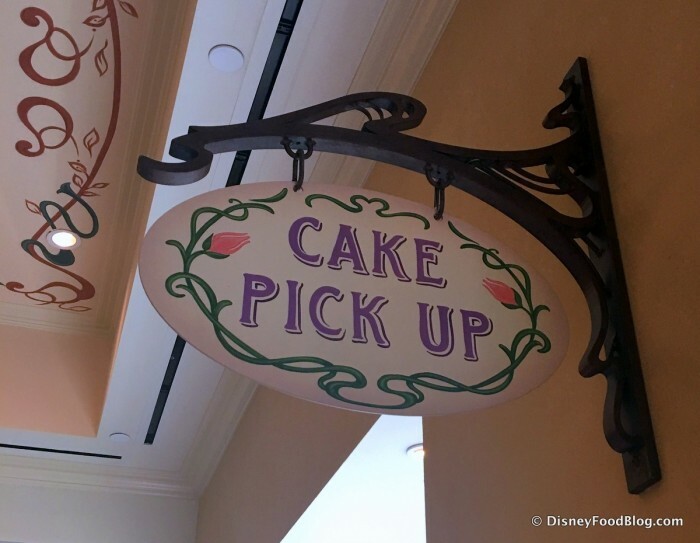 Will this bakery accept custom orders? Like, what if I wanted the Donald dome cake but with the flavors/ fillings of the Mickey cake? It’s for my sister’s birthday, and she loves Donald but hates lemon flavors…. Keith — Give them a call to double check, but I bet they would. They’ve been friendly and accommodating when I’ve called them. Their number is (407) 934-3500. This place is an absolute MUST DO! I went special for the petite cake as seen in this post and let me say, it did not disappoint. I do not know how the DFB Team got such a clean cut unless the shop cut it for them with a really sharp knife. The plastic knife and fork didn’t do as well but I was still able to get a decent picture to post on my Facebook. It’s definitely enough for two. As I mentioned, I went specifically to eat this little cake and used it as my lunch. I was almost able to finish the entire cake. I did take the left overs with me and although I had to carry it around with me for several hours, which made the fondant quite soft, it was still a tasty midnight snack. At $15.00, it is a bit of a splurge, but what a treat it was. Thank you DFB for this post, I will definitely be going back!